In August, Power-Con 2018 celebrated the 35th anniversary of “He-Man and the Masters of the Universe”. This annual event brings together He-Man enthusiasts from all over the world. This year, there was a slightly different focus: celebrating the writers behind the show, including Experts Exchange user Rowby Goren. When Rowby first began writing for He-Man in 1984, the studio was looking to add some humor to a few episodes. Fresh off the success of “Laugh In,” “Saturday Night Live’s” predecessor, Rowby was in high demand. Not all comedy writers make it in Hollywood. To make it, you have to deliver a laugh. And deliver he did. His most notorious He-Man contribution came from the episode titled, “The Greatest Show on Eternia” where the circus came to town and He-Man’s nemesis, Skeletor, was shot out of the circus tent straddling a giant firecracker. Some purists, Rowby explained, criticized the episode and it received a few scathing reviews. At this year’s anniversary celebration, however, fans from far and wide came to meet the man behind this memorable storyline, calling it an infamous but funny episode. One fan (pictured below) even brought his kids to the conference specifically to meet Rowby. Rowby’s comedic writing eventually led him to an Emmy for his work on “Hollywood Squares”. He was reaching great success in his career, but despite this and the demand for his writing, there was something else tugging at Rowby’s interests: computers. While honing his comedic chops and navigating writing success for shows like “Laugh-In”, “Three’s Company”, and “Teenage Mutant Ninja Turtles”, Rowby also spent his time exploring the world of computers and emerging technologies. At the very beginning of his writing career, Rowby came across a catalog called “Heathkit” that sold kits for building computers at home. In one of these catalogs, he saw an advertisement for a Homebrew Computer Club gathering, where tech-minded hobbyists would gather to trade parts and information pertaining to building personal computing devices. (This is a very different interpretation of the word “home brew”, often known as the act of making moonshine, whiskey, beer at home.) These computer club gatherings were made popular by tech enthusiasts and trailblazers like Steve Jobs. Rowby began attending, and for him, it was fascinating to witness demos of the latest creations. At one Homebrew event, Rowby saw Radio Shack present their first computer design. With a hefty price tag and the inability to do upper and lowercase letters when typing, Rowby waited until the Kaypro computer was released so he could work on scripts at home. Its storage capacity at that time was a couple of floppy disks, Rowby said. The Kaypro computer quickly became very popular with writers in Hollywood. Rowby was instrumental in teaching many other writers how to use computers and he coached several studios through the adoption of modem technology. By adding modems to studios, writers could digitally send their scripts, removing the need for messengers and in-person drop offs. “Modems at that time only had 1200-baud capabilities,” he laughed. Even with (to us) this small bandwidth, the use of modem technology allowed secretaries to quickly update and deliver scripts to actors, directors, and necessary parties already on location, resulting in faster production of shows. While working at Filmation, the studio responsible for He-Man, Rowby earned the reputation as the “Guy Who Understands Computers” and he was relied on by his peers for help and instruction. His understanding stemmed from a true interest in learning about the new machines that were released, and he could often be found trying his hand at different applications. With his new Kaypro literally at his fingertips, Rowby said he was finally like a fish in the ocean; a computer guy from the very beginning. That was the beginning of the end for Rowby’s writing career. 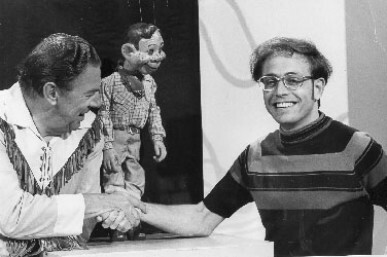 Rowby meets his childhood hero, Buffalo Bob, and Howdy Doody when they visited NBC. During his writing career, Rowby developed websites for friends and colleagues on the side. He began using basic HTML, a language he said he was relieved to leave behind for Microsoft FrontPage, then Dreamweaver. And finally his current platform: Shopify. Experts Exchange became a resource for Rowby as he began developing more and more websites. He asked his first question on Experts Exchange in 1997, wanting to know how to deal with unwanted mouse grouping. He couldn’t recall how he found Experts Exchange, since Google searches weren’t yet commonplace, but he said he realized when he had issues with his code and development, Experts Exchange was the place to turn. Never one to shy away from utilizing the site, no matter the size or complexity of the issue, Rowby said he’s made a point to ask for help whenever he needs it. He said he’s always met with professionalism and timeliness from the experts and certified professionals who are willing to help. Not only has he been a longtime account holder, but he has a strong success rate of receiving helpful solutions. He said this success stems from his formula for asking a question on site. The formula begins with a strong title for the question, an outline of the problem, and information on what’s already been done or tried. He then provides sample code if applicable, adds a screenshot of a quick mock-up that explains what should happen, responds quickly to any clarifying requests, and politely expresses appreciation for each expert’s time. Rowby also awards points to anyone and everyone who’ve helped answer his question in some way. This extra step properly rewards experts for their contributions, and he said for him it’s a way of saying thank you. Whether he was setting up modems in the studios or venturing into e-commerce websites—a transition he was initially hesitant to make—Rowby said he appreciated the help he found on Experts Exchange. E-commerce technology in 1997 was fairly basic and not very secure. Credit card information was often sent over email and most companies and industries were not required to store information on secure servers. This made the world of e-commerce website development a little more risky. But with the release of Authorize.Net, Rowby began to explore the e-commerce world and found installation of credit card technology to be easier than before—and more secure. “Even though it was easier, it was still quite different than what you experience today. You could order one potholder or 20. You couldn’t order, say, one potholder, one cup, and one bowl. The transaction could only be for one product type,” Rowby said. He experienced similar early dissatisfaction with the release of several open-source, e-commerce platforms. For him, Magento and Drupal created too much work and Wordpress was so daunting for most of his non-tech merchants, he avoided it whenever possible. When a WordPress merchant client accidentally downloaded a Shopify theme four years ago, Rowby fell in love with the platform. Now Rowby works exclusively with Shopify. He said he’s been pleasantly surprised by how easy and scalable Shopify is to use. The transition between his set up and a merchant’s day-to-day maintenance of a site is also simplified. While he has found Shopify to provide great documentation for its users, narrowing the margin for error, Rowby still relies on his Experts Exchange account. “Experts Exchange has really saved me—many times. While I work with programmers when a client requires special customization, many times it’s just me and I have to get things done. Whether it’s an issue that’s happening live while people are buying products and it needs to be solved within the hour, or it’s something that can wait a day to be fixed, I always get fast help,” he said. Other than concise headlines and responsiveness, he finds the accurate use of tagging topics to be helpful. If an issue is with PHP, he may also tag HTML in order to reach a wider berth of certified professionals who are active online. His writing background also comes in handy when asking questions. “I know how to describe issues to clients who aren’t tech savvy and I can also translate my own technology issues in a way that will get me help from programmers,” he said. Rowby now owns his own ecommerce website development business, with plans to grow and perfect his work in this field. His current focus lies with Shopify sites that want to offer product subscriptions, such as monthly subscription boxes, using Shopify’s popular Recharge application. While professionally, Rowby now focuses on computers and websites, he continues to have his hands in two industries. He still occasionally produces comedy sketches that appear on YouTube and other video platforms, and with such a storied career in television, his contributions continue to be celebrated. This year’s Power-Con, for example, specifically celebrated He-Man writers. It’s also clear through Rowby’s efforts to modernize communication efforts at Hollywood studios during a time when that technology was not widely used, he impacted more than kids watching beloved cartoons and shows— he impacted an entire industry. Perhaps those contributions are worth even more of a celebration. Thank you for your longtime use of Experts Exchange, Rowby! To chat with Rowby on Experts Exchange, visit his page here.